Habitat: The staghorn sumac is very hardy and generally grows in open places such as roadsides, forest edges and clearings. It likes lots of sun and tolerates most soil types, including poor dry areas. This species is very pest and disease resistant. Sumac male and female parts are found on separate trees, so if you want those brilliant berries, make sure you get both pollen-producing and seed-bearing trees. Birds such as evening grosbeaks, northern cardinals and ruffed grouse will eat sumac berries in winter and early spring, but often as a last resort. 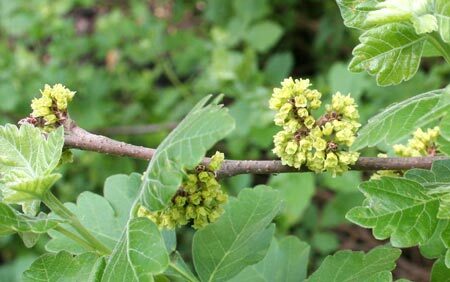 Mammals also make use of this shrub as rabbits, moose and deer browse on the leaves and twigs. Some butterflies use this plant as food for their young, and sumacs provide nectar for bees and other beneficial insects while providing great shelter for many more wild creatures. When I see a staghorn sumac, I often think how exotic it looks. And that’s no wonder considering that sumacs are found all over the world, including the Middle East, Asia and southern Africa! The staghorn sumac, however, is native to the southern half of Ontario and eastwards to the Maritime provinces. 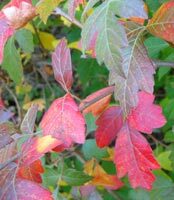 And there are other Canadian species, such as the smooth sumac in western Canada, the fragrant sumac in the prairies through to Ontario and the shining sumac in southern Ontario. All put on a grand show in autumn of brilliant hues of orange and yellow that become deep red. The beauty of our native sumacs continues into the winter with clusters of fuzzy bright red berries. click on the smaller versions. and turn a radiant red or orange in the fall. The thick branches are hairy and resemble the velvety antlers of a male deer (stag), hence the common name of “staghorn.” Clusters of small greenish flowers form an upright cone that yields crimson red berries covered in fine hairs, beautiful against a blanket of snow. Sumacs send up shoots that are easy to cut back if unwanted. But if allowed to spread, clumps of sumacs will develop a remarkable shape like a single domed canopy above several trunks. Staghorn sumacs grow to three to six metres tall. The leaves of the staghorn resemble those of the poison sumac belonging to the Toxicodendron genus and found in pockets of southern Ontario and Quebec in wet places. But poison sumac leaves tend to be shorter and wider with no serrations along the margin. Interestingly enough, this is the same genus that contains poison ivy and poison oak, a couple of low-growing plants with leaves of three that are potential skin irritants (hence their genus name derived from the Greek toxicon (poison) and dendron (tree). These three species used to be included in the genus Rhus, but were later put in a genus of their own because of certain differences, such as having smooth white berries instead of furry red ones. The delicate flowers of the fragrant sumac provide nectar for bees and other beneficial insects. Humans have enjoyed sumac berries, which have a zingy lemon taste when picked at their peak, typically in late summer or early fall. Soak berries of all Canadian sumacs in hot or cold water and then strain to make a refreshing drink or a gargle for sore throats. If the drink is too sharp for your taste buds, add a little maple syrup, but keep the gargle pure. 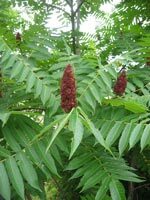 Other sumac parts have been used in a variety of ways: fresh sumac stems have been used in basket weaving, the tannin-packed leaves and bark have been used for tanning leather and the roots have been made into teas that help stop bleeding. 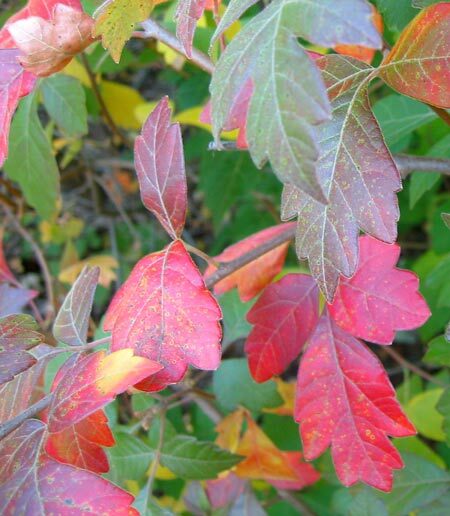 Fragrant sumac leaves in the fall. Either way, mature sumacs will spread by sending up shoots from their roots. This is great if you have an open area that can accommodate these beneficial shrubs. If you don’t want them to spread, however, surrounded your sumacs with mowed grass or have them back onto a shady area. William Cullina of the New England Wild Flower Society recommends in his book Native Trees, Shrubs & Vines to gather berries in the fall or early winter and let them air dry for a few days. Once dried, lightly scuff them with sandpaper and soak in warm water overnight. Plant them outdoors and watch for growth in the spring. The staghorn sumac is very hardy and generally grows in open places such as roadsides, forest edges and clearings. It likes lots of sun and tolerates most soil types, including poor dry areas. This species is very pest and disease resistant. Native to: sAlta., sSask., sMan., Ont. and swQue. Habitat: Grows in open dry woods, clearings, banks, and rocky and sandy areas. Prefers sun to partial shade and tolerates both moist and dry soils. Appearance: Low shrub of one to 1.8 metres tall with three leaflets that are aromatic when crushed between fingers. Similar leaf structure to poison ivy. Inconspicuous flowers appear earlier in spring than other sumacs. Small, roundish clusters of fuzzy red berries in mid to late summer. Stems and trunks are hidden under dense foliage that gradually spreads sideways. Habitat: Dry rocky slopes, canyons and foothills. Tolerates a variety of soils but prefers sun to partial shade. Appearance: Similar height and appearance to R. aromatica but leaves are more obed and berries less hairy. To see an image of this plant, click here. Native to: Pockets of B.C., Man., sOnt. and sQue. Habitat: Found along woodland edges and old fields. Likes sun or partial shade and moist to dry soils. Appearance: Similar to staghorn sumac but with hairless twigs. Grows to three to five metres and has 11 to 29 leaflets. You may click for more information and images. Habitat: Found in sandy or rocky areas, along edges of woods and in clearings. Likes partial sun and moist to dry soil. Appearance: Similar to R. glabra but smaller; reaches 1.5 to 2.5 metres. Leaves have five to 11 leaflets that are smooth along the margins (no serrations). The leaf stalk is 10 to 20 centimetres long and looks like it has wings with a narrow band of leaf-like material growing alongside the stem in between leaflets. Twigs can be both smooth and hairy. Red berries. Slow growing. Click here for more information and images. 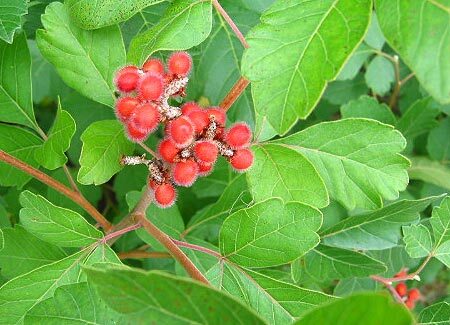 To find out where you can acquire your own native sumac, visit the Wild about Gardening native plant supplier listing.